The R70 bio-shredder is a hobby machine, used to shred garden waste, branches of hedges and small prunings (with a maximum diameter of 50 mm), resulting from the maintenance of small green areas. The machine can be equipped either with a single-phase electric engine or with a petrol engine (Honda/ Subaru). The material to be shredded is introduced into one single hopper, it is shredded by a fix blade in hardened steel and it’s finally ejected at 650 mm from the ground through a small ejection pipe. 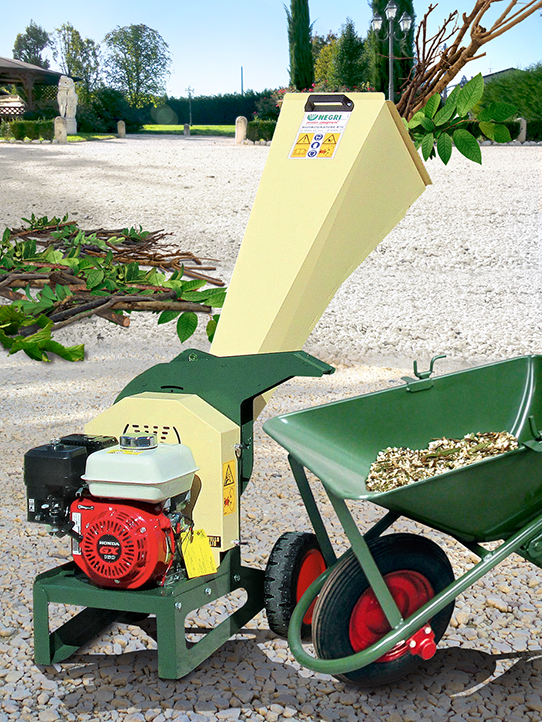 The ejection blades placed behind the chipping disk create a strong suction that facilitates the expulsion of the green material, which can be loaded into a wheelbarrow or a container. The belt transmission for petrol engine versions and the direct transmission for the electric version make the R70 bio-shredder particularly safe, even in case of accidental introduction of inadequate material. Built in a simple and sturdy way, this bio-shredder is easy to handle and to move by means of its two big wheels.